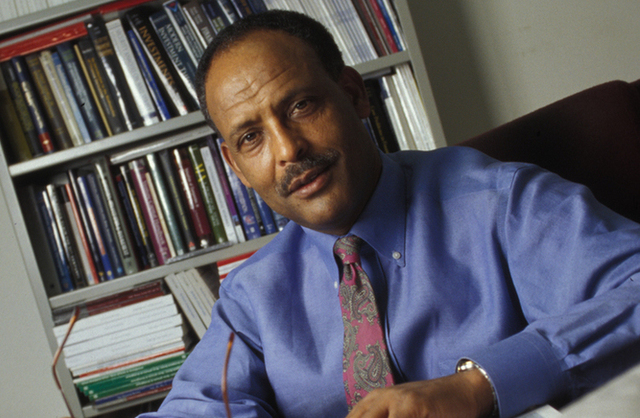 Lemma W. Senbet, the William E. Mayer Chair Professor of Finance at the University of Maryland, College Park has been appointed Executive Director of the African Economic Research Consortium (AERC). New York (TADIAS) – Professor Lemma W. Senbet, an internationally recognized leader in finance studies, has been appointed as the new head of the African Economic Research Consortium (AERC) – a Kenya-based non-profit organization that conducts independent research concerning the management of economies in sub-Saharan Africa. Dr. Lemma currently teaches at the University of Maryland, College Park where he also chaired the Finance Department at the Robert H. Smith School of Business. Dr. Lemma was selected for the AERC position after a worldwide search. Speaking to Tadias about the agency Dr. Lemma stated, “This is an organization which has already achieved immense success in building capacity for research and training to inform economic policies in Africa,” noting that his appointment as the Executive Director of AERC comes at a time when a number of countries in the region are enjoying strong economic growth. Professor Lemma noted that he hopes to emphasize research and finding ways of delivering measurable and credible results for those managing the content’s financial system. “In the ultimate, the purpose is to build capacity to do rigorous research and provide training to impact economic policies which help sustain, and even accelerate, the current economic growth momentum in Africa,” he said. Professor Lemma will take a leave from his academic position and relocate to Nairobi in Summer 2013. In a profile highlight that appeared in this magazine in 2004, the Ethiopian native had shared with us then that as a young man he gave up his aspirations of becoming an engineer after hearing news of the opening of a new business school at Addis Ababa University. He enrolled at the business school and graduated with top honors. He went on to acquire a Masters in Business Administration from University of California, Los Angeles, and a PhD in International Finance from State University of New York in Buffalo. Prior to joining the University of Maryland, he taught at University of Wisconsin, Madison, and was a visiting professor at Northwestern University, University of California, Berkeley, and New York University. Since then, Professor Lemma has advised the World Bank, the International Monetary Fund, the United Nations, and several other agencies in areas relating to corporate finance, capital market development, financial sector reforms and banking regulation. He has also served as Director of the American Finance Association as well as President of the Western Finance Association. Over the years, Dr. Lemma has sat on the editorial boards of prestigious peer-reviewed publications, including the Journal of Finance, Financial Management, and the Journal of Financial and Quantitative Analysis. More recently, he was recognized by the Society of Ethiopians Established in the Diaspora (SEED) as a distinguished scholar, teacher and role-model. And he is also a recipient of an honorary doctor of letters from Addis Ababa University, his alma mater. “Is it sustainable?” we asked. Speaking of the “the Euro crisis”, what are Professor Lemma’s thoughts on the overall global financial crisis and how it may continue to affect African countries? Congratulation to a dear friend and colleague! It should be noted that his accomplishments also live through those that he mentored. Among his former students are currently Dean of Carnegie Mellon’s Tepper School of Business and Chief Economist of the U.S. Securities and Exchange Commission. The apponitment is timely. DR. Senbet’s vision to scale up the partnership of African institutions as well as the private sector engaged at the interface of private and public policy issues, such as governance, risk management, and financial regulation is right on point because as it stands tight now the AERC’s mission rests on two premises. First, that development is more likely to occur where there is sustained sound management of the economy. Second, that such management is more likely to happen where there is an active, well-informed group of locally based professional economists to conduct policy-relevant research. The organization needs to do more and expand. Congrats Prof! Well deserved and AERC will gain much from your extensive knowledge and professional network! very happy to read this post, an Ethiopian head of AERC, where I spent about 4 months in research training three years back. Congratulations Professor Lemma! Best wishes on your new job! I want to point out that I agree that it is imporatnt to strengthen local/national institutions concerned with economic policy research. Congratulations Prof. Lemma, it’s a great honor. The continent’s growth depends on each countries stability and most importantly a true democratic leaders. I hope ECA & AU would establish a system that enforce accountability of the elected officials. Again Good Luck Prof. Lemma! I believe your appointment is timely and couldn’t have been any other person than you at this time for AERC and for Africa in general, looking at what you’re bringing on board. I wish you well Prof.
Congratulations Sir. Before his accession to this great position, Executive Director of AERC, he chaired my AERC research group, Group C. I am happy that AERC was able to figure him out to head this Top Research Network. Sir, keep your smile alive and your readiness to appreciate; AERC researchers, officials and partners need your welcoming and open hearted approach. You seriously deserve this success, you have made us all proud. Congratulations Prof. Lemma. Having read your views on what you intend to do heading AERC and your views about the continent, am so impressed and do strongly believe that you will surely move AERC to the next level of excellence. Congratulations sir.